By luck or by miracle, over 80 passengers and crew have survived a plane crash-landing amid horrible weather conditions. The outdated aircraft was falling apart and a fire threatened an explosion, however nobody died and only a few were injured. ­On Wednesday, a Tu-134 plane flying into the airport of the city of Osh in southern Kyrgyzstan had a hard landing, allegedly due to insufficient visibility and thick fog. The craft fell heavily to Earth and lost its trajectory, leaving the landing strip. Making its way off the tarmac, the plane flipped over, losing a wing and wheels. The situation became even worse as a fire started. But a fire crew, which immediately arrived at the scene, put the blaze out. Meanwhile passengers began evacuating from the plane. Men were helping the elderly, women and children to get out of the vehicle as many of them were screaming from pain and fear. ­“The landing was very rough, then we lost a wheel and the plane started spinning, then we flipped over and so we were hanging upside down on the safety belts,” one of the passengers, Askar Rustamov, was quoted by Rossiyskaya Gazeta. Rustamov said that he was one of the last ones to leave the plane. “I was standing at the emergency exit and remember that some airport worker was waving his hands so I remained where I was, because it was high above the ground, then someone screamed that the plane is going to explode now and I jumped,” he said. There were about a dozen of children among the passengers. One adult and seven children were taken to hospital after the accident. One of them, a seven-month-old girl, was diagnosed with a head injury and concussion. ­Many of the passengers were in shock after the crash, about 50 of them requested counseling. A special commission is investigating the incident. 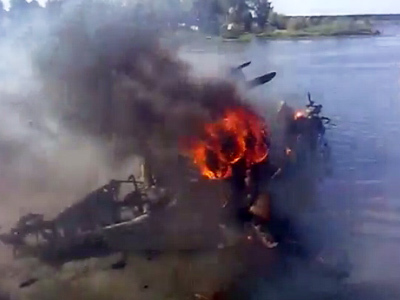 Reports say one of the likely causes is a mistake made by the pilot operating the aircraft. 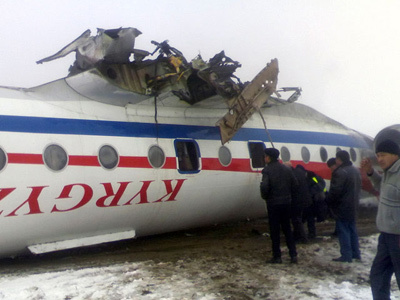 The Ministry of Transportation of Kyrgyzstan said that the crashed vehicle was working its last days, with its airworthiness due to expire on 19 January. It was also reported that the aircraft had been manufactured in 1979 and was not equipped with modern navigation systems such as GPS.